In Nelso ERP we have automated the G/L process for accurate and efficient accounting. G/L accounts which are required to perform your day to day business activity, will be there in the system. You can run ‘Chart of Accounts’ report to view existing G/L accounts. After reviewing them in case if you need to add or edit any G/L account, you can use this screen to perform that task. Ledger Name : Enter or type the ledger name which you want to create. Example: Rent Expenses, Rent Received, Electricity Bill, Telephone Bill etc. Ledger Description : Give a description to the G/L account which you are creating. 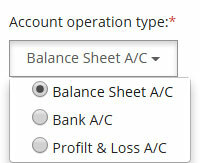 Account Operation Type : There are three operation types which are present in this field. Balance Sheet, Bank and Profit & Loss. Depending on the nature of account please select the appropriate option. 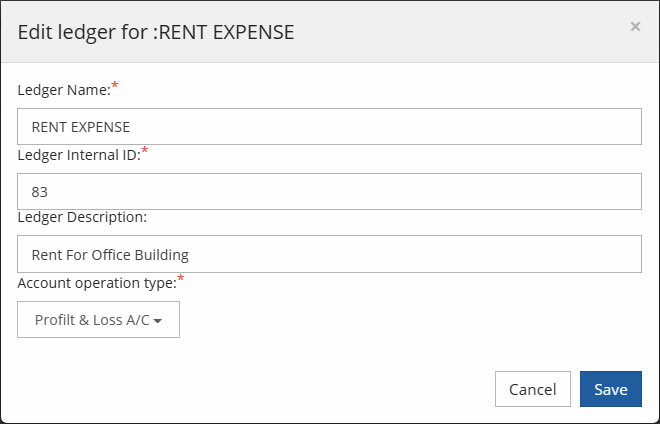 In this example, while creating Rent Expenses account, account operation type should be Profit & Loss. Once you enter the details on above fields , Click on CREATE. After clicking on Create, following message will display, once you confirm new G/L account will be created successfully. After your selection, please click on EDIT. Please make required changes and then click on Save.